In about 1200 a house was built for the Bishop of Rochester on a site between modern day Hercules Road and Carlisle Lane. Some time about 1217 it was rebuilt and called La Place. In 1531 a poisoning attempt was made on John Fisher, Bishop of Rochester, by his cook Richard Rouse (Rose). But the Bishop ‘eats no pottage that daie’ although 14 guests died instead. Rouse was boiled alive at Smithfield till he died. John Fisher did not live much longer as he fell out with Henry VIII over divorce and was beheaded on 22nd June 1535. His head was stuck on a spike on London Bridge where it stayed for two weeks before being thrown into the river and replaced by the head of Thomas More. In 1539 the Bishop of Carlisle took over the house. During the Commonwealth period the house was sold but it was returned to the church in the Restoration although it was never again used by a bishop. From 1690 to 1730 part of the property was used as a pottery and from then till 1763 it was a tavern. Over the next 23 years a dance master had the lease, after which it was used as a private residence and an academy for young gentlemen till 1826. 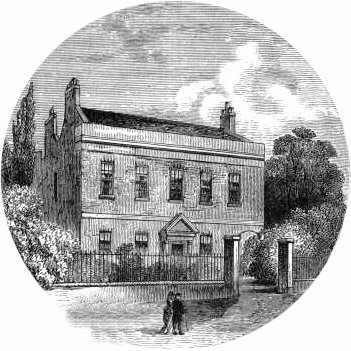 In 1827 it was demolished and smaller houses were built on the site.